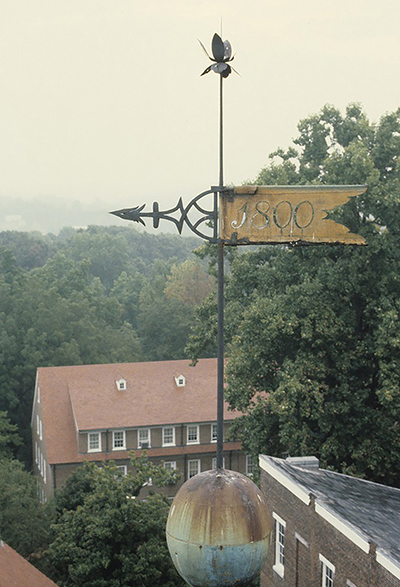 The cupola on the Home Moravian Church in Winston- Salem, North Carolina, is connected to down conductors and grounds so that it can serve as a lightning rod. Photo: Sunni L. Goodson. The loss of historic buildings as a result of lightning strikes makes local front page news every year. Lightning strikes make no distinction between historic properties and other types of structures. Historic barns, churches, museums, homes, stores, factories, lighthouses, schools, and other buildings, as well as structures such as tall monuments, may be at unnecessary risk of damage or loss as a result of a strike by lightning. The insurance industry reports that 5% of all claims are lightning-related in the U.S., with annual building damage estimated as high as $1 billion according to Underwriters Laboratories, Inc. Certain types of structures are especially susceptible to damage, particularly churches where lightning accounts for nearly one-third of all church-building fires each year. Lightning protection systems in the United States date back to colonial days and the time of Benjamin Franklin. Old systems that have survived in whole or in part on historic structures may be historic features in their own right and deserve preservation. Such historic lightning protection systems may still be operating properly or can be repaired and upgraded. Some old systems simply are too deteriorated, incomplete, or archaic to repair and make fully functional, raising the question whether they should be saved in place or removed in whole or in part for safety. For historic structures that have none and are located in areas that are prone to lightning strikes, or are of special significance and deemed irreplaceable, a modern lightning protection system may merit installation. This Preservation Brief is designed for owners, property managers, architects, contractors, and others involved in the preservation of historic structures. It includes information on the care, maintenance, and repair of historic and older lightning protection systems; discusses factors to consider in assessing the need for a lightning protection system where none exists; and includes historic preservation guidance on the design and installation of new systems.